Halloween Reese’s Candy for Everyone! Reese’s candy is one of the bestselling Halloween candies year after year and it’s not hard to see why. Decadent milk chocolate and creamy peanut butter make up these delicious treats, which is a winning combination anytime. We are well stocked with Reese’s in all shapes and sizes, so the only thing you have to do is choose your favorite! Reese’s Pumpkins – A classic. The basic peanut butter cup shaped into a larger pumpkin…which means more peanut butter! Reese’s Ghosts – Delicious peanut butter filling made into cute ghosts and covered in white chocolate. Reese’s Pieces PB Cups – Peanut Butter cup filled with Reese’s Pieces, which means 2x the deliciousness. Reese’s Eyeballs – Creepy eyeballs packed with peanut butter and covered in chocolate for a creepy, crawly treats. We also have multi bags filled with an assortment of Reese’s Candy for you to choose from! 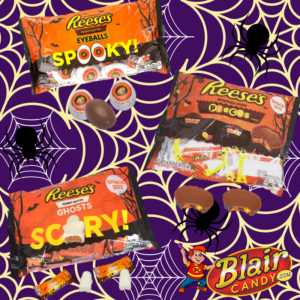 Shop all Reese’s candy and Halloween candy now at BlairCandy.com.